As Joyce has mentioned on our Facebook page, Hot Chocolate Festival is going on from now until February 14. My first stop (maybe my only one) was at Bella Gelateria in the downtown area by Burrard Station. It was late in the afternoon, the rain was pouring down and you could feel the cold bite at the tip of your nose. Hot chocolate was the only solution to help cure my body after a tough week at school and help me finally unwind for the weekend, even if it was just for an evening with good company before having to immerse myself back into school work. The outside of the gelateria is simple and elegant. The inside is a fairly small space, with a display window filled with desserts and wooden tables that were decorated with little vases and flowers and candles. Sweet fix for the weekend. 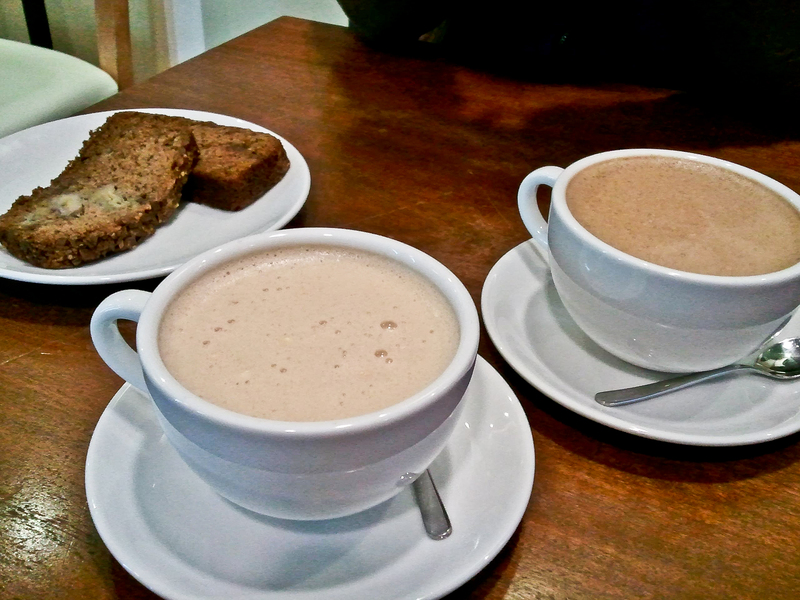 There were about 5 types of hot chocolates to choose from, so we picked the Italian honey nougat with milk chocolate and the salty caramel with dark chocolate, both came with a slice of Erin Ireland‘s famous It’s To Die For Banana Bread. The Italian honey nougat was smooth, rich, and the pieces of nougat that you find (especially the ones where you could still taste the honey) were like little pieces of honeyed sunshine in your mouth, hahaha. Yes it was sweet, almost like a milder liquid version of a Ferrero Rocher chocolate, but with little nougat pieces to add some crunchy texture. And because it’s nougat, it doesn’t go mushy or soft even when it’s been sitting in your drink for awhile. The salty caramel dark hot chocolate was a little too “cocoa-y” for me as I’ve never been a fan of dark chocolate, and you could really taste the saltiness, but not so much the caramel. It definitely was not my favourite of the two, but it was still good – especially if you are a fan of dark chocolate. The lighter one is the Italian honey nougat and the darker is the salty caramel dark chocolate. 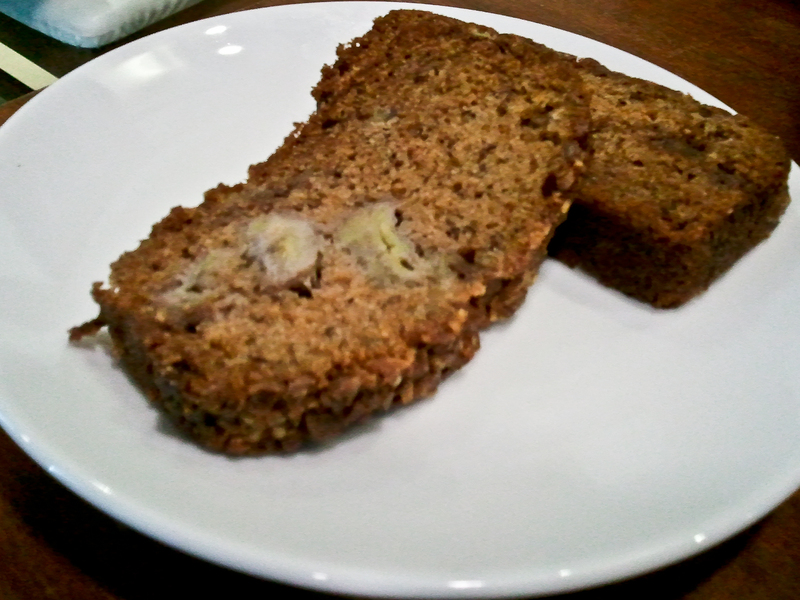 As for the banana bread, amazing. It was soft and moist, a consistent texture throughout the whole piece. I hate it when you can clearly tell if you got an end piece or where the top part is really soft and the bottom part was much firmer. It was sweet, but not through excessive sugar but through the natural scent of banana. I had a piece that had actual pieces of banana in it, made it a nice consistency with the slightly spongy cake texture. That was it, we spent a good amount of time enjoying our early desserts before heading out to Nuba for dinner (also a good place to go, will review some other time). 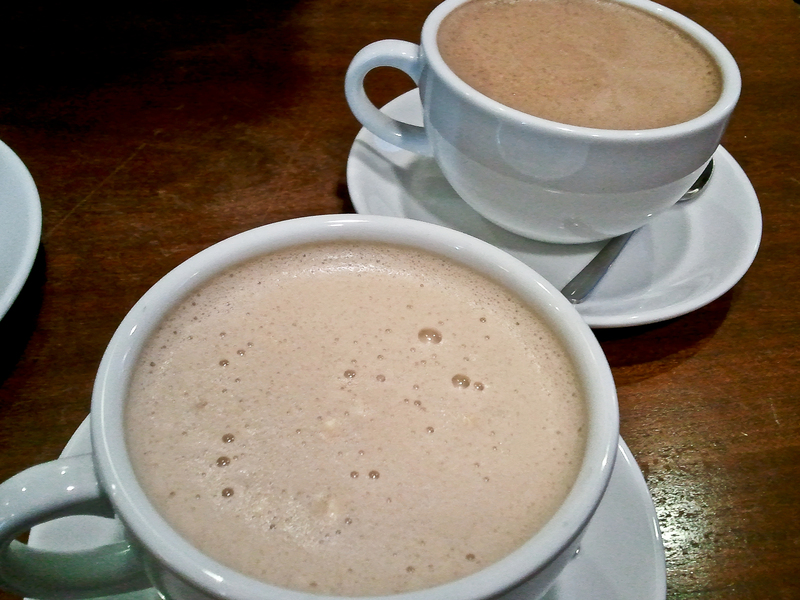 If you are craving for gelato or hot chocolate, definitely a good choice to go with a friend or a date. If you’re looking at the gelato, don’t hesitate to try it before getting it – you’ll need the extra help, because it’s hard to pick just one. Sorry guys, I brought my camera but forgot the SD card, hence terrible photo quality. Please forgive my horrible horrible ways – I have the memory of a bald and overweight 75 year old man. Toodles for now and happy eating!